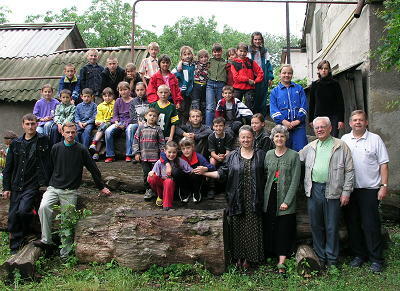 Since 1991 LifeNets has worked with Light of Love mission in Vinogradov, Ukraine that provides street children and orphans food, Christian value instruction and love. 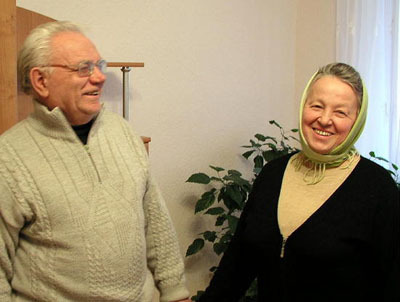 The mission was founded and is run by Vasyl and Irina Polichko. The vast majority of our support for this comes from the Rock Valley Christian Church in California the Scharpen Foundation which supports Christian Sabbath related efforts. Summer 2012 Mission and Reports/Photos/videos by Participant with links to former missions. The reason we have come into contact with the Polichko's as well as many others in this Transcarpathian region of Ukraine as a result of our common Christian beliefs which center on knowing the biblical Jesus Christ, what doctrine He taught, what He practiced, what days He worshipped on etc. Our first acquaintance and work with these people with whom we have common Christian beliefs and values started in 1991. We have been working with Light of Love mission since 2001. While visiting with the Polichko's in December 19, 2007, my wife Bev and I engaged in a most interesting conversation about the origins of his ministry and their working with kids, in particular. Bev and I then got into a discussion with Vasyl Polichko about the start of his work and ministry. He started about 1989 by distributing religious literature when this area was still the USSR and this type of evangelistic activity was frowned upon. He was able to obtain Russian material in Latvia where the propagation of Christian literature was further advanced. The printing of religious literature was not allowed in Ukraine. He set up a booth at the bazaar and gave out literature, but also invited people to come to sing-a-longs. He traveled to a neighboring village called Chornotissa, too. As it got closer to 1991 whcn the USSR fell apart almost overnight, there was more freedom from the government, but not from the Orthodox Church. The Orthodox priests threatened people who came to his sing-a-longs with denial of service to families (such as performing funerals and giving communion). It's interesting that when the Soviet government no longer persecuted the Sabbatarians, the Orthodox Church quickly took its place. Vasyl and Irina came back to Vinogradov. When the weather turned colder in the fall, the Polichko's obtained a small building for his Church services which they use to this day. They held services there on the Sabbath and meetings with music on Sundays. The music attracted a lot of young people. I first met Vasyl Polichko in 1992 when I came to Rokosova and Khust on my first vistit. I travelled with John Karlson who was regional director in Germany of my Church. When John and I first crossed the border from Zahoney, Hungary to Chop, Vasyl Polichko was at the Ukrainian/Hungarian border waiting for us but we missed each other, but we met the next day in Rokosovo. Vasyl and Irina are an amazing couple who symbiotically work with one another. He is partially blind. They both actively give themselves in service the Church and in particular to the children they care for, even though they do not have children of their own. They continued with the work of their church which is still at its present location behind the courtyard of the police station of Vinogradov. Vasyl Polichko reminisched about how about in the year 2000 street children came into the courtyard to congregate, play and roughhouse. Those going to church services and meetings had to walk past them and the children would often mock the brethren, saying "here come the believers!" After a while Polichko came to the kids and aid "let's be friends instead of enemies." He'd invite the children into the church building, have sing-a-longs and give them food. They did indeed become friends. I visited the Polichkos as a fluke in June of 2001. He started the soup kitchen in that year when I visited them in Vinogradov - it was a fluke visit that turned out to become the wonderful Vinogradov experience that we have been involved in since. You can read that story on the LifeNets Web site at www.lifenets.org/vinogradov. This became the start of the LifeNets Vinogradov Street Children's Program which became a reality when several families in California made it their church and family mission to care for these children which number between 30-40. The first supporters were David and Stephanie Liesenfeldt followed by Scott and Carolyn Scharpen who represented the Rock Valley Christian Church in Elsinore, California and Scott and Carolyn of the Scharpen Foundation. The police station moved to another building in Vinogradov and gave their building to Polichko to be made into a soup kitchen for the kids. LifeNets was involved in the remodeling process as the feeding of children moved from the church building to the former police station. The location is very adequate. It is enclosed by a fence and wall. The courtyard is used for play and activity. The church building is used for services while the old police station is used as a soup kitchen and common room for education and music. As of this writing in February 2013, we have visited the soup kitchen numerous times, have conducted four summer programs and continue with the resources that God has provided for us. The Polichko's trusted coworkers of many years are Vasya and Maria Tomaschuk who were married in May, 2007. They are surrogate parents to orphans at the Home for Orphans with Family Orientation and have become the first "parents." This is a building that Vasyl Polichko built over the last eleven years. His dream has been to make it into a school for educating pastors, yet not be totally a theologically-oriented curriculum. It has been a struggle to get the building built which is quite impressive and has lots of possibilities. Since he's been working with Street Children with LifeNets support, the Vinogradov Community asked him if he could start an orphan program but with a family orientation. Actually, it's quite an advanced concept to bring children from institutionalization to a better environment. It works like this: Groups of about five children would be with "parents." This gives children a "Mom and Dad." There will ultimately be four groups of children of five to seven each who will have a couple overseeing them. They will try to provide the mother and father. Vasya and Maria Tomaschuk are the first "parents." Maria said that it's been difficult finding others who would want take on such a responsibility. This children's home with family orientation was officially opened just this past September 6th. The president of Ukraine was to come for the dedication, but twice could not and they simply had the dedication on September 6th with local government officials, but the daughter of the President also made an appearance. Maria's regular job before marrying Vasya was working in a children's nursery for 13 years. She had a high certification in social work which is required to take on the current position she has.